Some cards in the game end up shifting around due to how powerful they are at any given moment. It’s this diversity and mixing that lets metas shift about and formats to change, and it’s what makes things like rotation so effective for card games – when the pool of cards becomes smaller like it does in Standard, innovation takes over and new combos have to be conceived of with the cards available. Delcatty ended up being like that throughout its time in Standard. Delcatty is a Colorless Stage 1 Pokemon, 70 HP, with a Fighting Weakness, no Resistance, and a Retreat Cost of 1. Energy Draw was the main appeal, as it was a Poke-Power that let you discard an Energy card in exchange for drawing 3 new cards. Max Energy Source though costed 1 Energy and did 10 damage times the amount of damage attached to all of your Active Pokemon – keep in mind this was in a time where Double Battles were a thing in the TCG, hence the wording. Needless to say, Delcatty’s Energy Draw is what people would gravitate towards, especially in today’s game. It’s effectively a faster version of Swampert’s Power Draw, only requiring Energy at the cost of coming out as a Stage 1. So you can imagine that people would love to run this – and combined with the right Energy acceleration, the cost would be negligible. The attack doesn’t really do much, and it’s unlikely that Delcatty would have it buffed that much – outside of getting the GX treatment in today’s game. But that’s the thing about Delcatty’s time in Standard – it fluctuated, because sometimes you didn’t mind tossing that Energy away for whatever reason, whereas with other times you’d end up in places where you’d rather keep the Energy in your hand, even at the cost of not drawing as much. Sometimes Max Energy Source is a great attack, but other times it’s pretty mediocre. And that’s what makes Delcatty interesting in and of itself. In today’s game, I think it would definitely be run – Zoroark-GX and Swampert already see a fair amount of play thanks to their own Abilities, so I would hardly think that Delcatty’s restriction would keep it from seeing play. But back in those days, it was a matter of whether the Energy discard was really worth it over anything else. Arora Notealus: I don’t really know the impact of Delcatty from back then aside from a brief blurb saying, “It was in some decks, and then it wasn’t”. More or less. Still, cards end up like that all the time – even cards we’ve thought would be pretty popular had similar trends! Just look back on some Top 10 lists and see if you can find a couple of cards that didn’t quite make the cut. Next Time: Back from the depths of the sewers and Team Rocket’s clutches! This Throwback Thursday, we do the time warp to look at one of the great supporting Pokémon in the history of the TCG: Delcatty (EX – Ruby & Sapphire 5/109; EX – Power Keepers 8/108). For those unfamiliar with the history of the game, this card bookended the EX-era. No, not that EX-era (Black & White through XY); the Gen III related TCG sets all had an “EX” prefix because even the-powers-that-be didn’t think they’d do something like recycling the Pokémon-ex concept (introduced in EX – Ruby & Sapphire) with minor tweaks as Pokémon-EX, then Pokémon-GX. EX – Ruby & Sapphire was the first set released under what would eventually become The Pokémon Company International (TPCi), released on June 18, 2003. That’s barely over a month after the final Wizards of the Coast translated and produced expansion, Skyridge. 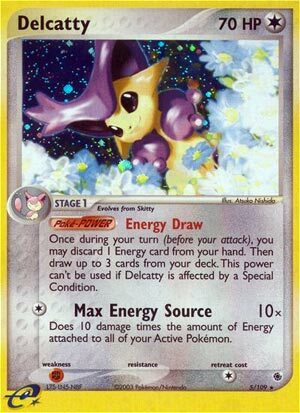 Delcatty was released with the same everything but new art in EX – Power Keepers, a “reprint set”, on February 14, 2007. This means we had Delcatty for about two years, it rotated, then it returned for about a year and a half. We even reviewed it three separate times back in the day. Now… WHY SHOULD YOU CARE? This Delcatty is a [C] Type Stage 1 Pokémon with 70 HP, the traditional damage doubling [F] Weakness, no Resistance, a Retreat Cost of [C], a Poké-Power, and an attack. The short explanation of a Poké-Power is that it is a predecessor to the Ability concept, but Poké-Powers are not Abilities and vice versa. I will indulge myself a little by pointing out Poké-Powers were part of a mechanic that was vastly superior to Abilities. Delcatty’s Poké-Power is called “Energy Draw”, and it is your typical non-attack effect you can use once during your turn before you attack, though that applies to each instance of the non-attack effect e.g. if you’ve got three copies of this Delcatty in play, you can use each Energy Draw once. Energy Draw requires you discard an Energy card from your hand in order to use it, and after doing so you draw three cards. The Energy card you discard can be a basic Energy card or a Special Energy card, not that you would really want to use the latter except under dire circumstances or for particular combos. Like all Poké-Powers, Energy Draw won’t work while Delcatty is afflicted with a Special Condition… but that isn’t too big of a deal, as it wasn’t attacking too often. Its attack was… niche back in the day. In most decks, it wasn’t good: “Max Energy Source” required [C] to do 10 damage times the amount of Energy attached to all of your Active Pokémon. That isn’t a typo; also debuting at the same time as this card were the rules for 2-on-2 play, where each player had two Active Pokémon and only four Pokémon on the Bench. I never cared much for that rules variant and it didn’t seem to take long before cards stopped referencing it, though as recently as last November there were still official rules for it, albeit only for non-Championship series tournaments, like side events. So, in a deck that could dump a lot of Energy on Delcatty, this was okay. This was a time when doing 10 per [C] Energy required was still a solid deal, and this attack was a scalable version of such a thing; got a Boost Energy you can spare? Slap it onto Delcatty for a quick 30 damage, which was adequate for what was supposed to be a Bench-sitting support Pokémon. Delcatty was played for its Energy Draw, which worked well with early EX-era decks. Blaziken (EX – Ruby & Sapphire 3/109; EX – Power Keepers 5/108) and Gardevoir (EX – Ruby & Sapphire 7/108; EX – Power Keepers 9/108) were two Energy accelerators, the former using its “Firestarter” Poké-Power to attach [R] Energy from the discard pile, the latter using its “Psy Shadow” Poké-Power to attach [P] Energy from the deck. Blaziken worked better with Delcatty, Gardevoir already had an incentive to run something to recycle its basic Psychic Energy cards from the discard pile (lost when something was KO’d), so it was easily able to adapt. Looking at the decks selected for the 2004 World Championship commemorative decks, three out of four features a 2-2 Delcatty line. Of course, of those three decks, only one was the winner of its age division (and it was a Junior Champion, not a Master or a Senior). Delcatty usage dropped off after this, not because of (or not only because of) the Team Magma beatdown deck that dominated the 2004 World Championships. We soon had Pidgeot (EX – FireRed & LeafGreen 10/112) and Magcargo (EX – Deoxys 20/107. Each of those Pokémon had Poké-Powers that granted amazing search, and even though Magcargo’s “Smooth Over” needed draw to go with it, Delcatty was simply crowded out of decks. Even being reprinted after an absence from the Standard Format of the day didn’t get Delcatty back into major decks… but it was still a nice option for budget and rogue decks. Besides the direct competition, Delcatty suffered because Pidgeot was so potent, as were certain [D] and [M] Poké-Powers released on other Pokémon, that Battle Frontier (EX – Emerald 75/106; EX – Power Keepers 71/108) was released. This Stadium negated the Poké-Bodies and Poké-Powers of Evolved [C], [D], and [M] Pokémon. It wasn’t around when Delcatty was riding high, but was introduced later to counter those other Pokémon and reprinted alongside Delcatty, really hurting its performance even after its rivals left the Standard Format of the day. I selected Delcatty because I very much would like to see an update of it released. While I normally dislike so blatantly generic of support, and while I do have some concern it would be too good for a big, owing to decks like Buzzwole/Garbodor (Guardians Rising 51/14), it just seems like something that would help a lot of other decks. Swampert (SM – Celestial Storm 35/168) has “Power Draw”, this is a better form of Energy Draw; discard any card to draw three. It is even easy to get as it is in a Theme Deck (Hydro Fury). Unfortunately, it is a Stage 2 Pokémon and I’d rather we did NOT get a super-shortcut to make it easier to slip into most decks, as such a thing would likely break something else. Zoroark-GX has “Trade”, allowing you to discard any one card to draw two, and it is a great attacker while only being a Stage 1, it is also a pricey card and being a Pokémon-GX runs counter to some strategies I’d like to see rise. So, ASSUMING something like Delcatty wouldn’t break the metagame, I’d like to see it released.